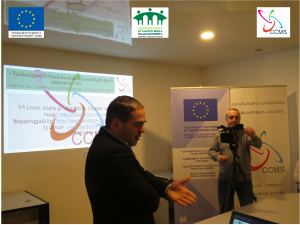 On January 30,2019 at the office of CCMS the kick off presentation of "Multi-Stakeholder Social Protection" project took place which is implemented by CCMS NGO. The duration of the program is 6 month, from January to June 2019, and it will be held in Alaverdi(Lori province), Dilijan (Tavush province), Sevan (Gegharkunik province) and Hrazdan (Kotayk province). 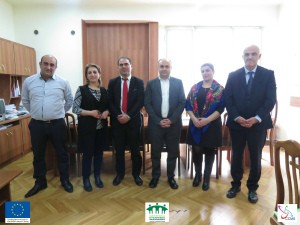 The presentation was attended by Hrant Ayvazyan who is a Deputy of National Assembly of Armenia, the Mayor of Alaverdi Sasun Khechumyan, the chief specialist of the Health and Social department of Lori Regional Administration Irina Grigoryan and representatives of other stakeholders from state and non-state sectors. 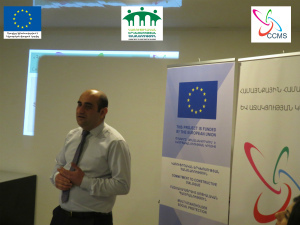 The purpose of this program is to contribute to the identification and improvement of mechanisms addressed to solving social problems of children and families living in especially difficult circumstances of life in Armenia, elaborating recommendations for improvement. 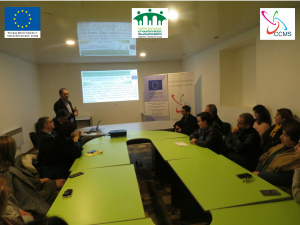 The program is implemented within the framework of the subgrant provided by "Commitment to Constructive Dialogue" program led by "Armenian Lawyers Association" NGO which is financed by the European Union. 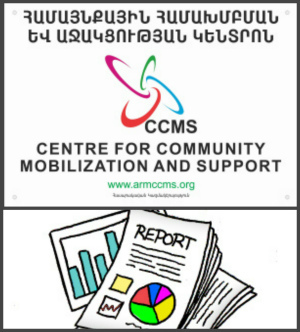 "The Annual Report of the Activities of CCMS"
Bellow you can see the report of the activities done by the Centre for Social Mobilization and Support NGO during 2018. In 2018,more than 50 communities from Lori, Tavush, Gegharkunik, Kotayk, Vayots Dzor, Ararat, Armavir regions have been included in the activities of the organization. In 2018, our organization defended the interests of general education, pre-school education, health care, children protection, protection of the most vulnerable families, local government and environmental protection. -1216 citizens have been involved in various non-formal educational courses and training seminars,704 of them are young people. -2482 children and young people participated in organized summer camps. -6041 children took part in different "protection of children" events. -133 the most vulnerable families were provided with social worker service, some social cases were handled. -244 the most vulnerable families were provided with humanitarian assistance. -80 children and young people were involved in language courses. -35 young people took part in some processes and actions of advocacy. In 2018,in the days of the revolution, the members of our organization were next to Armenian minor and adult citizens in order to protect them and ,if necessary, to resist any obstacle while expressing their civil position. The Organization showed an active attitude towards damaging the environment and human health, promoting health care and implementing assessments of environmental damage with the help of local and international institutions. In 2018,our organization supported the citizens affected by curruption cases in the management field to organize themselves and to apply to relevant bodies in order to restore their rights. During the Parliamentary elections on December 9, 2018 our organization within the framework of the "Akanates" observation mission held a long-term and short-term observation mission to provide free and fair election in Lori province. In 2018, the organization with partners founded the "Hamazark" transparent local governmental coalition, "Human rights protection" coalition and the coalition that deals with the problems of handicapped children. In 2018, the organization has been involved in the Public Council that is under the Minister of Natural Resourses and in the legal commission of the Public Council of the Republic of Armenia. Our organization has 78 volunteers and 23 employees. In 2018, about 70 volunteers and employees of the organization took part in various in-service trainings, seminars and forums organized in local and international levels. - Polish Fund "The heart of the Caucasus"
The 2019 year our organization has started with new numerous programs. The information about them you will see very soon .